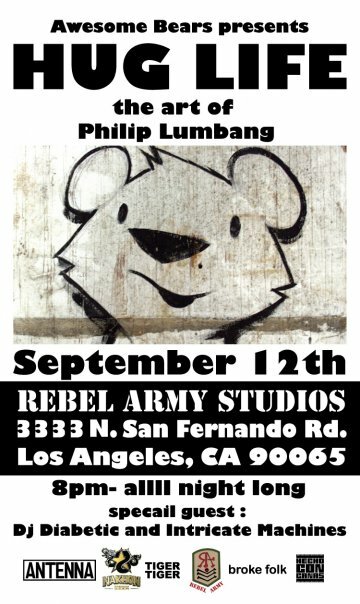 Our good pal and featured artist Philip Lumbang, known for his awesome bears and peaceful wooden area creatures, is having a solo show in LA on September 12th. We highly encourage anyone in LA to attend this event. 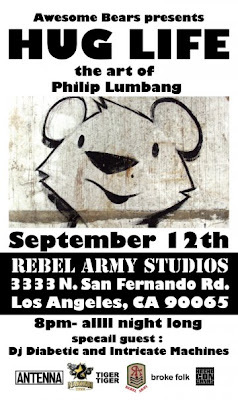 Philip is a fantastic rising artist that has been getting a lot of love for his happy bear murals and art. Check out the invite below and keep an eye open for some exclusive products featuring the HUG LIFE BEARS from Abztract dropping very soon. Don't forget that we have some original art from Philip in our shop too. You may click on the image to enlarge for details.